A volunteer is responsible for finding missing Katarina Rikic. She was found by the South Street Seaport in Mahattan and brought by police to the Richmond University Medical Center in West Brighton around 10:30 p.m. on Saturday. She appeared to be unharmed and in good condition when she emerged from an unmarked police car at the RUMC emergency room entrance. 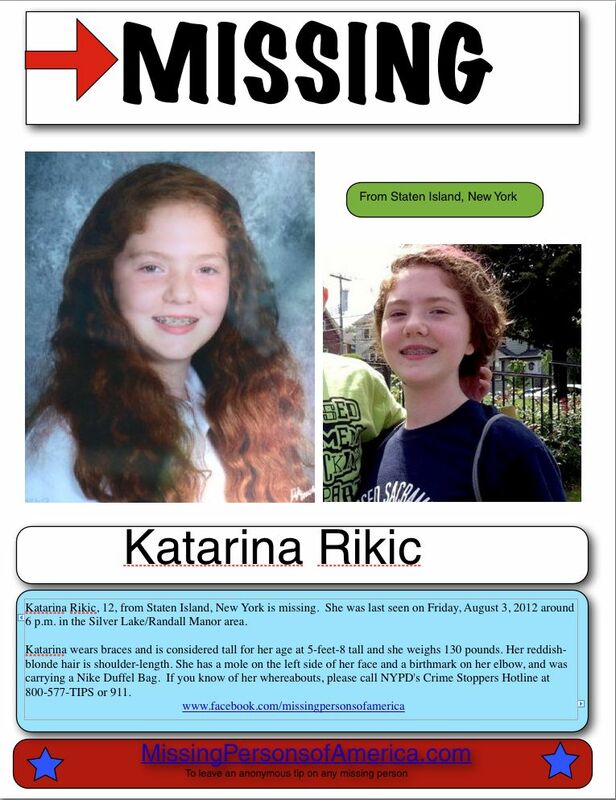 Katarina Rikic, 12, from Staten Island New York is missing. She was last seen on Friday, August 3, 2012 roudn 6 p.m. in he Silver Lake/Randall Manor area. Katarina wears braces and is tall for her age at 5’8″. She weighs 130 pounds. Her reddish-blonde hair is shoulder-length. She has a mole on the left side of her face and a birthmark on her elbow, and was carrying a Nike Duffel Bag. If you know of her whereabouts, please call NYPD’s Crime Stoppers Hotline at 800-577-TIPS or 911.